This tree in Colorado Southwestern White Pine is native to Colorado. This tree is found in the southwestern part of the state in its native habitat on ridges, slopes and canyons and grows in mixed stands up to timberline and is found occasionally in the montane riparian zones. It is also planted in urban landscapes. It grows well in a variety of soils, preferring loamy soils and disliking poorly drained soils. 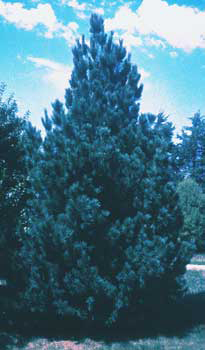 Growth rate, form and size Southwestern White Pine has a moderate rate of growth. After they are established in the landscape the growth rate will be around 12” per year. Young trees are dense, symmetrical and pyramidal in form. In most urban settings, it will reach 35 to 50 feet but can grow to 90 feet in its native habitat. It has an open irregular crown with long, horizontal branches with a mature spread of 20 to 30 feet. Foliage The needles of the southwestern white pine are in fascicles (bundles) of five. They are soft, bluish-green and 2.5 to 4 inches long. They are susceptible to salt spray, so care should be taken in planting them too close to roads. Cones The oval cones are 3 to 10 inches long with thick scales that are distinguished by a curled lip. They are light brown in color and are dehiscent (fall off) when mature. The seeds are wingless and are palatable to small mammals and birds. Bark The bark is ashy gray when young becoming blackish gray, rough and furrowed as the tree matures. Insects and diseases The southwestern white pine has been shown to be susceptible to white pine blister rust. It is fire sensitive when young. Older trees with thicker bark are more fire resistant. The thin bark and horizontal branches increase its susceptibility to fire.